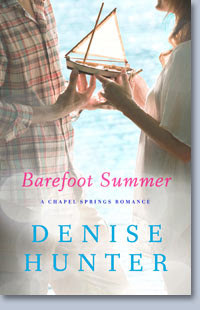 Barefoot Summer is the first book in the Chapel Springs Romance series by Denise Hunter. (Can you believe it, I finally started with the first book in a series!) This was the first book that I have read by Denise Hunter, but based on this book, I am pretty sure it won't be my last. She has written several other books, including a couple of series. Madison McKinley, one of the McKinley twins, lost her twin brother Michael to drowning about ten years earlier and hasn't yet healed. One of his dreams was to win the town's regatta before his 27th birthday, so that he could be the youngest to ever win it. Madison has decided that she wants to win the regatta for him, in his boat - in hopes that she will be able to put an end to the hurt and pain caused by his death. So, with her 27th birthday approaching in the fall, she buys sailing lessons from a man who has won the regatta, in the hopes that she can learn to sail and win the regatta. Only problem is that the man that she bought the lessons from can no longer fulfill the commitment and turns to Beckett O'Reilly to help him fulfill it. There is a history between Beckett and Madison, that as the story progresses we learn more about. He is the son of the town drunk and was a troublemaker as a kid. At first, Madison is resistant to learning from Beckett, but with time he shows himself a worthy instructor and her a quick study. And the sparks fly ... in more ways than one. I really liked the style in which the story was written. The focus on character development is around the two primary characters, with those around them developed mostly to help further define the main characters. The book jumps right into the story, using reflection and conversations to help the reader 'catch up' on the background, history and the different relationships. This occurs not just in the opening chapters, but throughout the story. The characters are hard not to like. I love how their relationship evolves slowly from that of distrust and dislike to one of trust and friendship to even more. As an outsider, it certainly seems obvious how each feels, but they have to slowly come to realize the attraction. This helps make it feel more real and the story more believable. I really enjoyed reading this book and was able to read it in a relatively short window. Given my schedule, trust me, I have to shift things to make that happen, to 'create' time to read - but I wanted to keep reading, to see how things progress and turn out. I would recommend Barefoot Summer to anyone looking for a enjoyable, summer love story. You can learn more about the story and what others are saying, by checking out the blog tour. You can find out more about Denise Hunter and her books, on her website. No compensation was received for this post. A complimentary copy was provided for this review through Litfuse Publicity. All opinions expressed are my own or that of my family.